‘ROBOCOP’ MELENDEZ FREE ON BOND FOR 2 LESSER FELONIES IN NEAR-FATAL DENT BEATING — JUSTICE? Instead of taking Floyd Dent to the hospital after near-fatal beating, “Robocop” William Melendez and others took him to this cell, where he was booked while crying out for medical attention. He also begged to go to the hospital at the scene of the beating, but was denied. DETROIT – Everyone is not satisfied that charges brought in the case of the near fatal beating of Detroit autoworker Floyd Dent by William “Robocop” Melendez, assisted by four other Inkster cops and four state troopers, will bring justice. The case has become notorious across the U.S. after police dashcam videotapes of the bloody beating were aired. 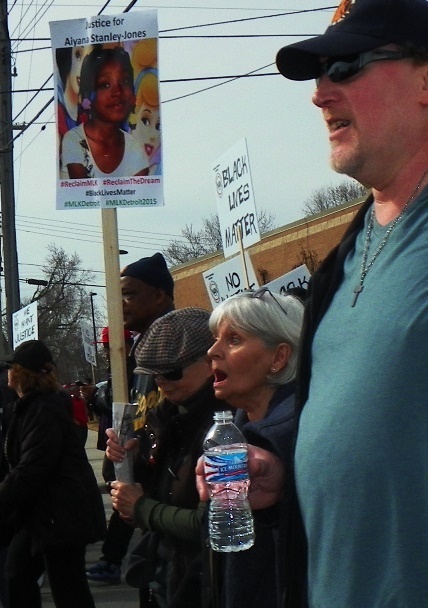 Four mass protests followed in Inkster and Highland Park, where Melendez also worked as a part-time narcotics detective. He has since been fired from both forces. 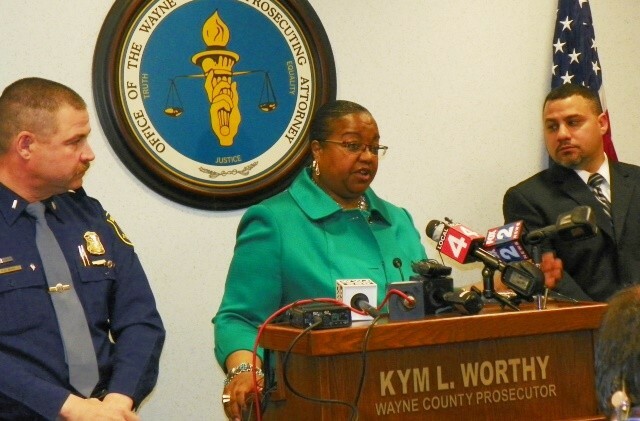 Wayne County Prosecutor Kym Worthy announced during a press conference April 20 that Melendez had been charged with two felonies: one count of assault with intent to do great bodily harm, which carries up to 10 years in prison, and one count of misconduct in office through mistreatment of a prisoner, which carries up to five years. Melendez was arraigned on the charges today at 2 p.m. in 22nd District Court in Inkster. A “not guilty” plea was entered, and his bond was set at $20,000. Worthy also announced that cocaine possession charges against Dent would be dropped in court April 22. She did not address the missing 16 minutes of a videotape of Dent’s treatment during his booking at the police station, which was to have been produced at that hearing in front of Wayne County Circuit Court Judge David Groner. Dent and his attorney Gerald Rohl said that tape shows additional “terror” and “humiliation” perpetrated by Melendez and other officers. Melendez and the others took their time photographing and fingerprinting Dent before someone finally said they should call EMS. 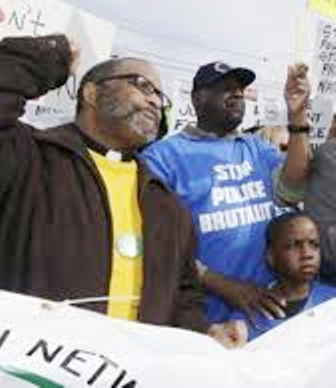 Father Ellis Clifton (l)protests with Floyd Dent and grandson at head of march April 2, 2015. 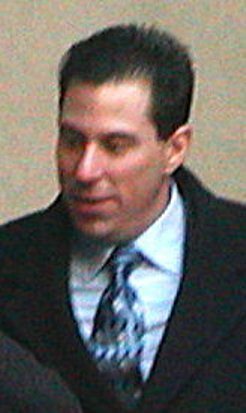 Melendez faced numerous such charges during the 2004 federal trial of a ring of cops he led, which had terrorized Detroit’s southwest side. One charge was that he told a witness that he would be killed if he testified. Federal prosecutors called the jury’s “not guilty” verdict a “nullification verdict,” noting that more than a dozen Black Detroit officers had testified against the Ramparts-style gang in addition to its Black victims. Worthy asserted during her press conference that the vast majority of police officers do their jobs well, and that she has “complete trust” in the Michigan State Police, who aided in the investigation of the Dent case, despite the presence of four state troopers at the scene, who Melendez testified actually participated in the events. 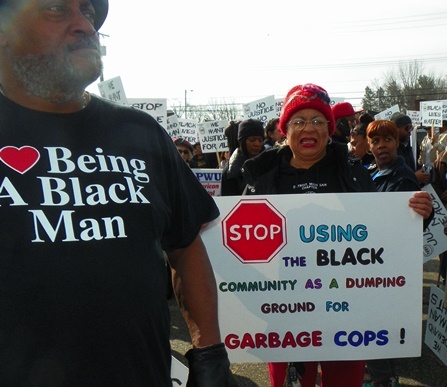 She said she was aware of the 2004 federal trial of Melendez and other cops and knew Inkster police chief Vicki Yost from her tenure with the Detroit police department, but would make no comment about the state of Inkster’s 80 percent white department. Yost was the partner of three-time killer cop Eugene Brown when he shot Lamar Grable, 20, to death in 1996. Yost continues to insist that her department has not finished investigating the Dent beating. He said Dent was “elated,” it appears mostly at the fact that all charges against him had been dropped. He told Channel Four that he had not been able to sleep for 90 days. Worthy brought no charges against Melendez’ partner, reserve cop John Zeileniewski, who dragged an unresisting Dent out of his car to the ground and held him by the legs, as Melendez put him in a chokehold and slugged him in the head 16 times with some sort of hard object in his glove, or another officer who tased Dent three times during the beating. She brought no charges against the other five officers present, including the troopers, for either taking part or failing to report the incident. She told reporters no charges of filing a false police report or perjury would be brought against Melendez. Earlier that day, Detroit’s Channel 7 aired an interview with Melendez in which he boastfully repeated his statement that Dent threatened to kill the officers, which Dent has vigorously denied. The video above shows Melendez at his arraignment and comments from his attorney David Lee, who also represented him in the 2004 federal trial. The officers present wore no mics. Melendez also testified during the preliminary exam that Dent bit him twice, although his report indicated “no injuries” to any of the police involved in the arrest. Rohl released a dashcam video which appears to show Melendez taking a baggie of drugs out of his pocket to plant in Dent’s car. 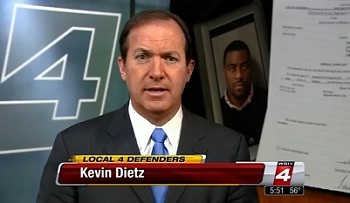 Investigative reporter Kevin Dietz of Channel Four’s “Defenders.” He broke the Floyd Dent story and has followed it assiduously since. Worthy said that she was not aware of the beating until March 23, when it was aired by Channel 4, with Kevin Dietz reporting. She said her office’s investigation into the case is now closed, “in the best interests of justice,” despite the missing 16 minutes of videotape. 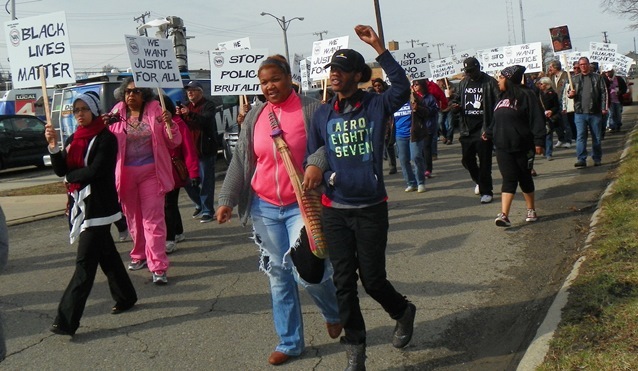 Inkster youth join April 2 march against beating of Floyd Dent. Marchers supporting Floyd Dent also carried a sign calling for justice for Aiyana Jones. Joseph Weekley is now back patrolling Detroit streets, as are all the other officers involved in the horrific raid on the home of Aiyana Jones, 7, and her killing with an MP5 shotgun blast to the head. VOD reported earlier that an inside source said many in the prosecutor’s office were not happy with the way the Weekley and Charles Jones trials were handled, both prosecuted by Wayne County Assistant Prosecutor Robert Moran. 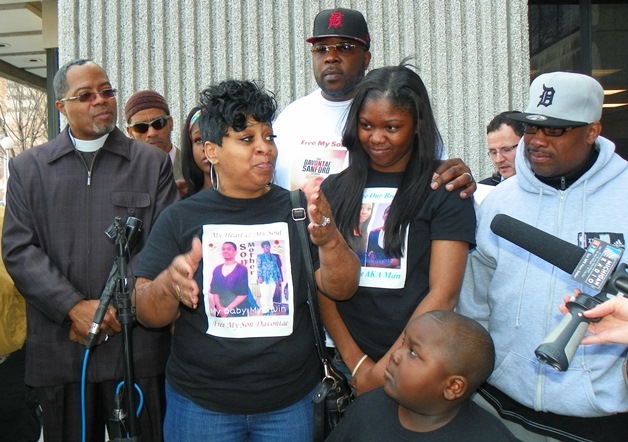 Davontae Sanford’s mother Taminko Sanford-Tilmon with his family members at press conference April 15, 2015. Neither man was charged until after a lengthy Michigan State Police investigation, which ended up being focused primarily on Jones. An interrogation video of Chauncey Owens, who pled guilty to the killing of Je’Rean Blake, shown at the Owens-Jones trial, revealed that he named another man, not Jones, as the one who gave him the gun. Attorneys produced a 24-page detailed confession from admitted hitman Vincent Smothers, attached to their motion, to the murders for which Sanford, 14 when arrested, is serving 37-100 years. 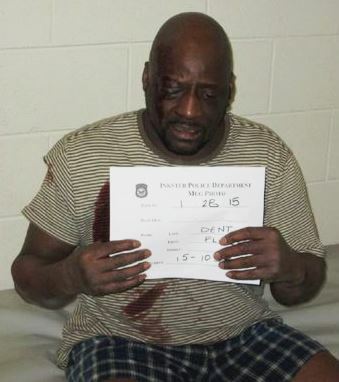 Worthy also refused to file charges against the Highland Park and Grosse Pointe officers involved in the videotaped beating of Andrew Jackson, now charged with carjacking. 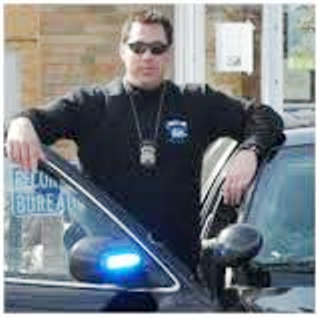 “The Detroit Free Press earlier reported that Highland Park Officer Ronald Dupuis had a long history of assaults in various suburban departments, including tasering a female partner, beating a disabled man, refusing to allow a woman in a jail cell access to a bathroom, forcing her to urinate in the cell, and stalking another woman, repeatedly pulling her over. He was fired from the Hamtramck Police Department for the taser incident, and resigned rather than being fired from the Southgate Police Department for the incidents involving the women. One Response to ‘ROBOCOP’ MELENDEZ FREE ON BOND FOR 2 LESSER FELONIES IN NEAR-FATAL DENT BEATING — JUSTICE? Why is Kym still in office? I can’t stand her, truthfully if this is the results of us voting we have to rethink what we are doing. I wonder if someone slapped her in the head like it was done to Mr Jackson would that be considered assault? I bet you it would so that officer should be charged with assault!